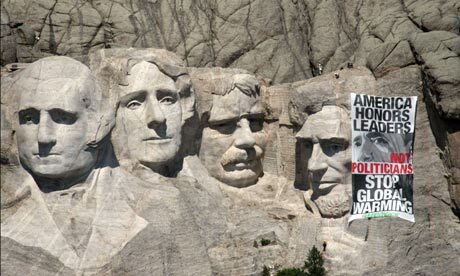 Since Greenpeace went to all the trouble to hang this banner, the least I can do is post the photo here. The publicity stunt was timed to coincide with the G8 Summit in Italy. Some of my fellow bloggers have been banging out PR trends for 2009, so I figured I’d jump on the bandwagon. And since I now have two weeks of insight into this New Year, my predictions will no doubt be far more accurate than theirs. One of the most challenging things about media relations has always been coming up with a creative pitch you think the media will like, getting the media’s attention long enough to pitch it, hoping they like it enough to run with it and then praying the media doesn’t run to a water-main break instead of covering your media event. But for today’s PR pros, there are numerous avenues around the Gatekeepers and directly to your target audience. As the media continues to feel the financial pressure of a downturn, the Gatekeepers will become more scarce. Become fluent in all the ways to reach your target audience and you’ll still be able to do your job regardless of the Gatekeepers. On a similar vein, the changing media landscape is changing our business. We now need to be fully conversant in media relations tools that didn’t exist 5 years ago. Social media, mobile media and the like are great ways to start conversations, and after all we are in the conversation business. Think about all the ways you can start conversations with your target audiences and develop resources to navigate those channels. Get aboard or get left behind. In the past, “diversity” was frequently given lip service while business was conducted as usual. No more my friends. The demographics of this country are changing rapidly and the Obama Administration will be the face of a New America. Hispanics will continue to grow in population and increase their economic and political clout. Other ethnic and racial groups will become energized and outspoken about having their place at the table. Design outreach strategies for these groups or suffer the consequences. Despite economic turbulence and see-sawing gas prices, Climate Change as a critical global issue is here to stay. The incoming administration has made it a priority and PR pros need to be able to tell a positive environmental story about their company or client. The best organizations will design proactive environmental programs that make it easy for their PR folks to communicate effectively to target audiences. Despite the increase in tools and technology relevant to our business, there is no substitution for effective communication. While the look and sound of that communication may change, one thing that doesn’t change is the critical need to make yourself understood by your target audience. Effective writing doesn’t just mean good mechanics, it means communicating effectively so that the message is received and acted upon. Good communicators are hard to find, treasure them. Too many organizations and clients today want to do things on the fly or on the cheap. Unfortunately, when you shoot the gun without aiming first, you will often miss. The way to take aim is to conduct research on your issue, your product, your audience, your message, your media and so on until you develop a communications strategy that you can have confidence in. Similarly, measurement must be done to determine if goals were reached (assuming you had measurable goals in the first place) and then adjust your strategy based on your findings. Don’t take shortcuts when it comes to research and measurement. I’m a stickler for doing things right, but at the end of the day you can only do the best you can with the resources you have. That’s why it’s so important to find creative ways to harness the resources to do the job right. Internal resources can often be begged and bartered, external vendors are more willing to strike a deal to get some work. Don’t be afraid to be creative or haggle when it comes to marshaling resources. Search engine optimization isn’t just for web heads anymore. Nearly all of your target audiences will seek out information about your company by using a search engine. All of the great PR in the world won’t help if the search engine results are not flattering, are inaccurate or point to a competitor. PR people need to be vigilant about their organization or client’s search engine results and take action when necessary. SEO strategies frequently span PR and web disciplines, so talk to your web colleagues today so you’ll be ready tomorrow. Social Media has created a tsunami of change for traditional media. Newspaper circulation and ad dollars are plummeting while tech savvy consumers get their news from the web, from cell phones and from non-traditional sources like the blogosphere (because that’s the way we bloggers roll). Networking sites like facebook and LinkedIn have created social and business networks that are radically changing the communications landscape due to their insular nature. Many media consumers now feel they have everything they need within their network platforms and needn’t venture out to get anything else. I can get a job, post a job, keep up with friends, keep abreast of current events and even buy products and services, often without going far from my network. Finding ways to intersect and disrupt social networks without intruding will increasingly become a sought-after area of expertise. Those are my Public Relations Predictions for 2009. Feel free to put them to work for you. Selling Water Can Be Fun and Profitable! I recently came across this article about the launch of Nestlé Waters first ever marketing campaign targeting Hispanics. The campaign includes an endorsement deal with Cristina, TV spots on Univision, spot radio in major Hispanic markets, print advertising (print lives!) a consumer contest and in-store hoopla. The best thing about all of this is that the ads feature Cristina talking about health topics, including the risks associated with obesity and diabetes. The campaign was created by the fine folks at Castells & Asociados. Obviously there are a lot of ways to sell bottled water and I applaud Nestlé and Castells for using their marketing muscle to get behind reducing obesity and diabetes in the Hispanic community. This is a cause which I cannot endorse more strongly. In 2005, one in four U.S. Hispanic adults was obese (not just overweight). But what’s most alarming is the trend with children. One in six Hispanic high school students is overweight and 24% of Mexican-American children aged 6 to 11 are overweight, compared to 20% for African American kids and 12% for non-Hispanic whites. It’s well known that obesity can lead to higher insulin levels and type 2 diabetes as well as other health problems like asthma, high blood pressure and sleep apnea. There are factors that contribute to this situation, including genetics, that cannot be controlled. But two major factors that we can impact are exercise and nutrition. Any effort to get kids and their parents to dump the soda and other high calorie, low nutritional value foods, should be supported. Everyone can benefit from drinking more water and from using water as a substitute for high calorie beverages. But here’s the rub. If you’ve been paying attention, bottled water producers are bottling and selling a product we don’t really need (tap water works just fine) and creating a nasty, land-filling byproduct in the form of plastic bottles that live forever. So what’s a health conscious enviro-wannabe like yours-truly to do? I’d gladly give Nestlé my frequently sought, yet seldom given, stamp of approval if: Nestlé also educated its consumers on the need to recycle those ugly little plastic bottles and better yet, provided an incentive for them to do so. After that, I’d hope that folks would get tired of expensive bottled water and turn to taps, filters and reusable bottles. But one step at a time. I recently completed a consulting assignment for a major national environmental organization. It was a great experience and I learned a lot. This is an article I wrote for the May 2008 edition of Virginia Business Magazine that describes the lessons learned. Since I wrote the article, I’m hoping that Virginia Business Magazine won’t sue me for reprinting it here. One of the most interesting and complex CSR/Green Marketing efforts I’ve been involved in has beenDominion’s Project Plant It!